Lifelong learning has become essential not only for professionals, but also for those they serve. Continuing professional education (CPE), an umbrella term used to describe the continuum of formal, nonformal, and informal learning opportunities that enable practicing professionals to continue to learn and to maintain professional competence across their careers, is the focus of this collection. The volume explores, analyzes, questions, and critiques CPE trends and issues across a variety of contexts, and it highlights new thinking and developments to assist providers and practitioners to re-envision their roles and set new directions in the field of CPE. This collection is inspired by the early seminal works of Cyril Houle who advocated that educational researchers and providers of CPE should listen to the experience of professionals as a basis for supporting their professional learning. This is the 151st volume of the Jossey Bass series New Directions for Adult and Continuing Education. Noted for its depth of coverage, it explores issues of common interest to instructors, administrators, counselors, and policymakers in a broad range of education settings, such as colleges and universities, extension programs, businesses, libraries, and museums. Maureen Coady is an associate professor and the chair of the Department of Adult Education at Saint Francis Xavier University, Antigonish, Nova Scotia, Canada. An historical overview of developments and changes within continuing professional education (CPE) is offered in this chapter. The authors identify four contested spaces in this field of adult education practice and suggest a way forward in arriving at a more unified picture or system of effective CPE across professions. Research on how professionals learn and construct new knowledge in practice is the focus of this chapter. The authors expand on earlier work, advocating a constructivist view of learning that links professional practice, context, and knowledge in an integrated system to promote individual and social transformation. Informal and formal mentoring, which encourages critical reflection, learning, and coconstruction of knowledge, is explored and recommended as a system of learning that can complement formal CPE to foster learning and improvement in professional practice. 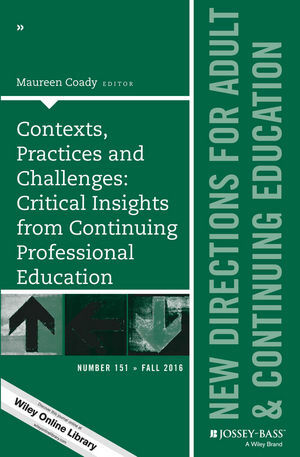 CPE for teachers and university and college faculty members is the focus of this chapter. The author examines power and knowledge forms, encouraging CPE that extends beyond technical and instrumental knowledge. The author explores online learning as CPE and strategies that foster emancipatory and communicative learning in professional practice. The author highlights global cynicism about CPE in the workplace, where professionals struggle to keep pace with relentless change. A “T” model is introduced as an alternative conceptualization and basis for creating CPE that is responsible, relevant, and sustainable and that helps professionals to navigate the professional white water they encounter on a daily basis. A model for negotiating power and interest among multiple stakeholders in CPE program development is proposed. The authors describe the development of a graduate certificate in adult education for health and medical professionals, which emerged through ongoing collaborative dialogue and consideration of contexts and needs of the health professionals and the CPE providers involved. CPE as a key component to the success in the military is the focus of this chapter. With decreasing budgets and increasing importance for a force that operates efficiently and thinks critically, the cognitive tension among training, education, and learning comes to center stage, challenging the sustainability of CPE in the military. The preceding chapters are synthesized in this final chapter, revealing a “state-of-the-field” view of CPE and future research vistas.